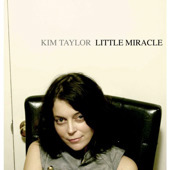 Kim Taylor’s third full-length record features nine easygoing tracks, showcasing her songwriting as much as her smooth, rich vocals. Recorded in The Maid’s Room in New York City and originally released digitally last year, Little Miracle takes a cue from balladeers like Elton John and Carole King with wistful, heartfelt lyrics and piano-driven melodies. A country-tinged organ lifts “American Child” past plaintive nostalgia, and a percussive backbeat makes “Do You Ever Feel Lonely” a hold-me-close dance tune; meanwhile, Taylor’s soothing vocals glide from earnestly hopeful to somber and restrained on the poignant “Lost and Found” and the haunted “Anchor Down.” It’s a perfect Sunday-morning soundtrack, but most of all, it’s the sound of a great talent slowly coming into her own.